A chance encounter on New Year’s Eve of 1938 propels Katey Kontent on a year-long journey into the upper echelons of New York society—where she will have little to rely upon other than a bracing wit and her own brand of cool nerve. In the first few pages of Rules of Civility, Amor Towles' wonderful debut novel, it's New Year's Eve in Manhattan, with 1938 a few hours away … With this bit of a wink, Towles conveys that he will be playing with some of the great themes of love and class, luck and fated encounters that animated Wharton novels such as The House of Mirth and The Age of Innocence. Towles' central figure, Katey Kontent (a great name) — born Katya to Russian immigrant parents in Brooklyn — travels in and out of America's world of privilege with wit and an eye for irony. The arc of the narrative is nothing really new: Sharp, working-class daughter of Brooklyn immigrants (25-year-old Katey Kontent) chance-meets a cartoonishly named Brahmin banker (Tinker Grey) at that great democratic equalizer — the jazz bar. Katey quickly climbs into a world where people go to college ‘in Cambridge,’ where summer is a verb — and where, it becomes clear, there's lots of tarnish amid all that monogrammed silver … But it's how Towles shades in the story that's most interesting, elegantly drawing a picture of a time and place seldom depicted in the current culture, when riders gripped straps on the elevated, when vichyssoise and Dover sole were the height of sophistication and when 'drat' and 'dame' were uttered unironically (and charmingly so). 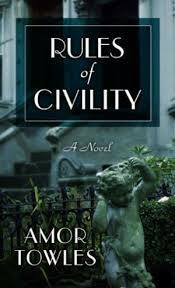 What did you think of Rules of Civility?